Tony Cummings (and others) report on Britain's Christian music institution, PHIL AND JOHN. It took four journos (Fran James, Gavin Drake, Tony Cummings and Jonathan Day), three interviews and a couple of years to piece together a Phil And John interview not made incoherent with explosions of laughter. Yet, it's a serious time for the Derby duo. Recipients of a special international award at the Dove Awards two years back, today the band have momentarily put aside thoughts of the lucrative American CCM market, started their own record company and produced the album they'd always wanted to make, an acoustic orientated one. It's gone straight to number one in Cross Rhythms Contemporary Chart. This then is Phil And John, 1990, 1991 and 1992. American Christian radio hits emerged from that and, disillusioned with their dealings with Word (UK), the duo struck out on their own earlier this year. Now with their own booking agency (Sounds Like Promotions) and record company (R Records, marketed into Christian bookstores through Kingsway) and a determination to record music they liked rather than music the market place dictated Phil And John have a new lease of life. Phil And John have been mates all their lives. Childhood friends, the duo grew up in a Nottinghamshire mining village. 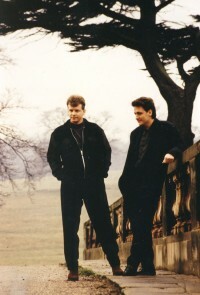 They began playing guitars at the age of 13 and, though only nominally Christian, were heavily influenced by Malcolm And Alwyn, Britain's seminal Christian music duo, and began playing concerts to church youth groups. Their debut gig was at Mansfield Sally Army Hall and their first album, at age 16, was called 'On The Line' and sold 60 copies! After 10 years, what makes Phil And John get out of bed in the morning? (John) "Well, somebody banging on the door! They've come for breakfast! Erm, I think we keep going because we enjoy it. It's a very good way of making a living, it's far better than going to an office every day or a factory or something and we're very fortunate in the fact that people still turn out to see us. That's why we carry on, I suppose." Let's begin again, how did you become Christians? (John) "I first became a Christian when I was 13, but I was so insecure then I used to ask God into my life every day. But I reaffirmed my commitment when I was 18 when Phil and I went to a Capenwray Bible School week. In fact, the whole of our youth fellowship became Christians, too - we were so wild, it was unbelievable. But that was when we all got sorted out and started playing gospel music and sang at the talent night." (Phil) "If I weren't a Christian, I would still be really into music, though not in Mansfield. There are not a lot of opportunities for secular music positions in Mansfield. It's more likely to be pigeon fancying." (John) "As soon as we became Christians, we got asked by Capenwray Bible to tour with them and sing for say 20 minutes before the preacher came on. Then we did a sort of 'apprenticeship' with the local churches in garages - where we worked with local BYFC evangelists and it got to a stage where we were doing four or five nights a week and it was either finish, or go full time and join with Derby Youth For Christ." (Phil) "There was a small but guaranteed income for the couple of years while we got on our feet a bit and worked things out. The first three months doing schools work really sorted us out. Before that we were up on the stage saying something and doing something different; not totally opposite, but not living life as we believed we should." Well, that's a bit of your history. Let's drag the whole thing up to 1992. Is there a good reason why you left Europe's biggest Christian record company? (Phil) "Yeah, it's called financial. We'd come to the end of our contract with Word and they're up for sale at the moment so a lot of their future plans they don't really know about, which is fine, but we didn't want to be stuck with a record company for maybe a year, year and a half who don't know where they're going, most of them don't know if they're going to have jobs in a week or two, so we thought now's the time to make a break, so we set our own little independent thing up and just get licensing deals and it's far better." (John) "We felt for a long while we wanted to do our own thing a little bit more and become independent. So we've set up our own little record company, 'R Records', Phil and myself and a friend. We've licensed the album to Kingsway. We're also going to license it to other record companies in Europe and America." So you're now linked with Kingsway. Does this mean a Phil And John praise tape? (Phil) "Absolutely not!" (John) "No -unless (laughter)". (Phil) "Unless John decides to do one on his own! (laughter)" (John) "One never knows . . ."
So you don't know if you're going to go metal either? (Phil) "There's more chance of us going heavy metal than . . ." (John) (interrupts) "Kingsway . . . just recently, they've got a new A&R guy, whom we know really well, called Les Moir - produces a lot of albums - we've had a chat with them about where they want it to go - the vision, and it's very much on folky lines. They're setting up a new folk label here and in America and it just seemed like the right move for us to sign our album over to them. But no worship tapes, no heavy metal, no jazz praise ... (laughter)"